The trip to Canada was a repeat "fishout" for me (first taken in September of 04). I booked through Elderhostel who has several fly-fishing trips covering both coasts and Canada. When I took the trip there were no extra charges for a single supplement. Five days of fishing, 6 nights lodging and all meals were included. Airfare/car rental was extra. Last year I stayed an extra day into Saturday, however, prior scheduling constraints shortened this trip. This year Homer Eaton and I went in July, the weather was warm and the fishing was excellent. We began our journey on a Sunday and ended the following Friday. We flew into Calgary and drove to our southwest destination in about 2.5 hours. Canadian scenery and locals were great and we even saw a small herd of buffalo near journey's end. We pulled into the Crowsnest Centre near dark and a meal was ready for us. About 40 people had signed up for the program as compared to 17 last year. Eve and Dave Walsh were our local guides along with their two sons and extra help. 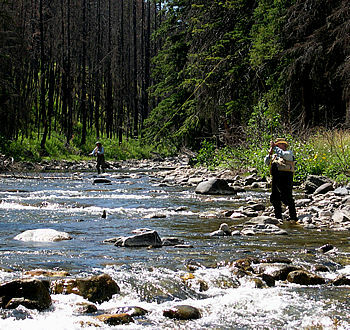 Although 40 people seemed too much - hiking and touring trips lessened the fishing load on the streams. We generally broke up into two parties and fished different streams so that crowding never seemed a problem. The elevation of the area is 4,000 feet. 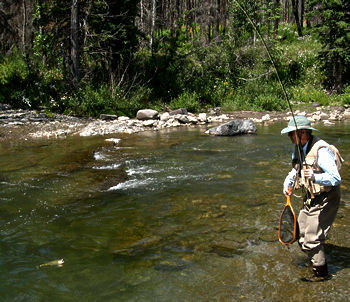 Many fly fishers used the "wet wading" technique in the temperate weather. 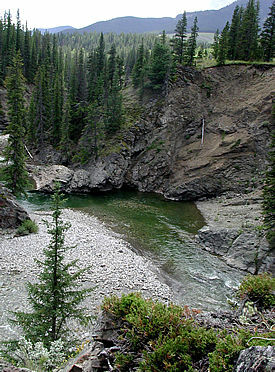 We fished 7-9 foot leaders, dry flies and weighted nymphs as we waded into the streams, pools and riffles of waters averaging 12 to 18 inches depth.. All fishing was for wild brookies, rainbows and "bull trout". We generally hooked into 6 - 9 fish daily and landed many. Evenings were filled with tours of the former coal mining area, local sights or fly tying. Tasty meals and lunches were provided at community tables or field locales. Fishing was available in the evening for those who weren't too exhausted from the 6-hour fishing during daylight. Homer landed an 18 to 20 inch trout and my catches were more in the 14 to 16 inch size. The battle on these wild fish was typical of much larger "planted" fish. We threw beadhead nymphs such as the hares ear, prinze and pheasant tail. The waters were so clear that dry flies were also a good choice. Our hosts were busy explaining the history and geology of the area and were pleasant company. I did a second Elderhostel trip to Montana in late September. If you're looking for interesting and well organized trips, check out Elderhostel.